I want to use a robot so I can reproduce the same calibration action across multiple cameras. 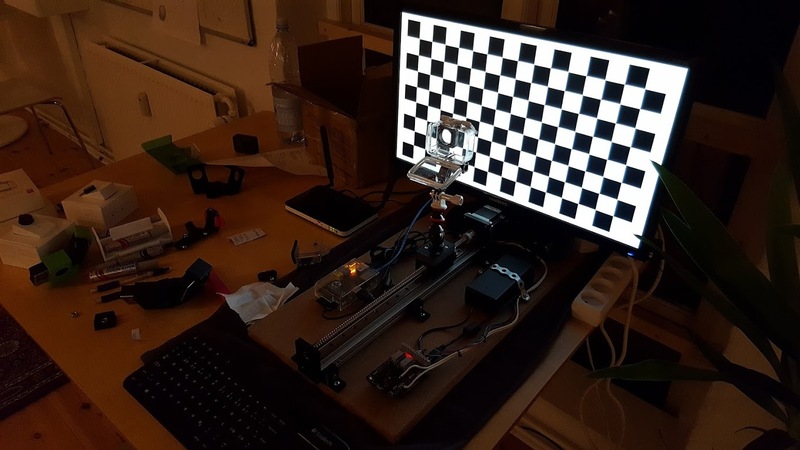 My question is if it will work only to move the camera linearly relative to the checkerboard or if rotation is required as well? i cannot answer,- but definitely - +1 for physical effort. accurate calibration once you find a good predefined set of poses. As you should be able to generate only a translational motion along the rail, you will have in my opinion to generate multiple translation / orientations (rotations) for the pattern. Or move the rail in translation and in rotation. The ideal case I think would be to cover the space in an hemisphere above the calibration pattern. The best would be to use a 6 dof robot to move the calibration pattern like in this video. Almost the same topic: Industrial Calibration Library Update and Presentation. You sure? He's translating into (or out of) the screen, so the points are going to basically move radially outward from the center as he moves closer. That should pretty thoroughly cover the area even without generating multiple sets. Here are some example images for camera calibration. Yes, I believe it should work. I haven't tried it, but you will get your points radially expanding outward from the center and cover most of the parts of the camera FPA. That should work. You do need to be careful that you can either see the whole target board at the same time, or that you adjust the number of rows and columns to match what the camera is seeing or you won't be able to detect the corners properly. Use the drawChessboardCorners like in the tutorial to make sure it looks right.